Before the popularization of the minicar, the motorcycle was essentially a more affordable means of transport than the automobile. But there was a fundamental change of direction in the 1960s. The two-wheeler concentrated on its role as a sports and leisure mount, a role quickly exploited by the Japanese. This lucky turn of events didn't blind Honda. to the fact that the motorcycle offered plenty of other possibilities. 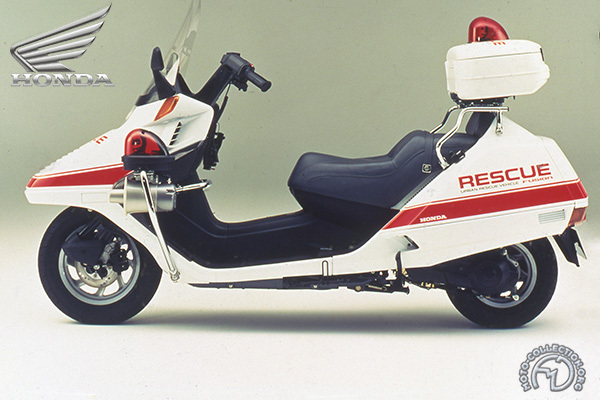 In the mid-1980s, the marque offered "Motomobiles," a new generation of utilitarian two wheelers that were practical, luxurious, and the most efficient means of overcoming growing urban congestion and parking problems. Launched in 1988, the Helix is a large scooter characterized by the very relaxed riding position created by a very "laid-back" armchair saddle. Known in various markets as the Helix, Fusion or Spazio, this strange machine is the custom king of scooters. Comfortable, easily handled and sufficiently fast (cruising speed is over 70 mph), its only shortcoming is its excessive rear width, which penalizes it in gridlocks. Initially designed for the United States, its engine size of 250cc was unfortunately large enough to compel its rider to hold a special motorcycle license in European markets. The Helix, plagued by a number of minor imperfections, did not achieve the anticipated success. However, it was effectively the prototype for a future generation of new motorcycles. Announced in 1988, the Helix foreshadowed a new generation of urban two-wheelers.